As anyone who tuned into the Aquarium Drunkard Show on Sirius/XMU last Friday is well aware, Endless Boogie’s Paul Major knows private press. 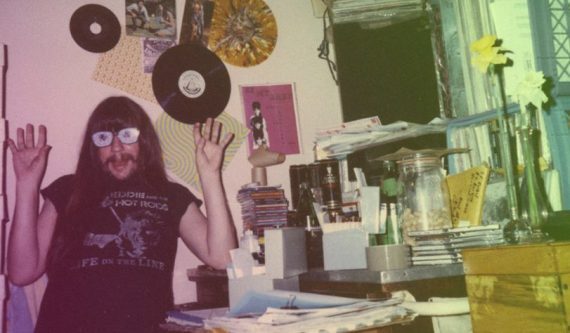 A longtime record dealer, his catalogs, including Feel the Music and Sound Effects, helped establish much of the vocabulary associated with rare psych, folk, rock, and outsider records. Now, working with Anthology Editions, he’s compiled the book on the stuff: Feel the Music: The Psychedelic Worlds of Paul Major. In addition to scans of the rare original catalogs, which featured Major’s hallucinatory, illustrative music writing, the new book gathers essays by friends and compatriots Johan Kugelberg, Glenn Terry, Michael P. Daley, Stefan Kery, Patrick Lundborg (The Acid Archives) and more, all of which help illuminate not only the music that has defined Major, but also his unique character and ethos. Likewise, when Major speaks, you get the sense you could spend hours listening to him, his conversation style free flowing and punctuated by belly laughs. He’s still jonesing for new tunes and far out sounds. The book, the new record — it all feels like part of some cosmic, unplanned event he’s just happy to have shown up for. Aquarium Drunkard: You write in the intro of the book that there was some “magic power in the actual physical object that enhanced the experience.” Early on, that’s what hooked you. After all these years, do you still feel that way? Paul Major: Oh yeah, I do. I think the thing that’s changed is my need to own them or not. [Laughs] I used to have to have them all. That changed. Records became a currency for me to survive, my way of making money. But I still get the thrill when there’ll be something I never saw, one of these legendary records. I get a charge of the actual artifact. “This is the actual thing that exists, the historic object.” But I can just listen to the music now — I don’t have to have an original pressing. I guess I burned out on that after decades of doing the catalog. But oh, I love when I see one of those records. A lot of them are 40 or 50 years old now. That’s another head twister, that these early psychedelic records are half a century old now. AD: You were drawn to the sound of fuzz guitar. What is it about that sound got you? Paul Major: I think the time in my life when I heard it. I think part of it is just the youthful energy and aggression. I think I just liked that sound but I linked it to the idea of psychedelic mind expansion, too. 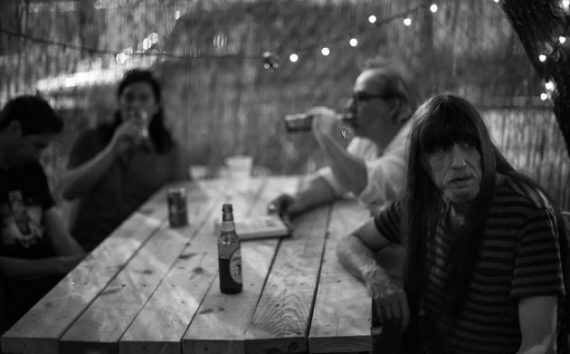 There’s this collision of garage rock energy coming across and people experimenting. At that time, it really felt like a new dimension. That fuzz guitar energy related back to my childhood obsession with [flying saucers] — I realized through physics that flying saucers weren’t visiting us, but it sort of felt like that. It felt like there was this world happening out there. I’m this isolated kid in Kentucky and I’m tuned into it and nobody I knew at that time was into it. I experienced it as it happened, which is sort of an unrepeatable thing. Those fuzz boxes, they just sounded alien. AD: When you started the catalog you wrote really interestingly these stream of consciousness descriptions of rare records. You seem to be writing from a very imaginative place. Where did that approach come from? Paul Major: It really was just stream of consciousness. The context of this catalog was, at the time, I’m trying to convey what some of these things sound like, knowing that nobody in the world’s heard ’em yet. As I built up contacts all over the world, people could call me up and I’d play them records over the phone. But with the writing, a lot of it was done on these long, all-night jags. I’d just start typing. The majority of the records being unknown and unheard, it just sort of naturally went my way; I’d plop the record on and sit at the typewriter and just sort of vibe on it and go. Sometimes, people have pointed out the me later in some of the descriptions of the more important records, it’s like I almost don’t mention how the music sounds. I’ll conjure up some scenario or write about what it reminds me of. Some loner folk album, [I’d write] “This guy’s probably sleeping on some naked mattress, one lightbulb hanging from the ceiling, a neon sign outside the window flashing on and off Twilight Zone-style.” I’d try and get people interested, not overhype them, but describe what they sounded like to me. AD: You invented a lot of the vocabulary we use to describe rare records now, but mentioned not wanting to overhype them. Do you find that sometimes people conflate the rarity of an album with its artistic merit? AD: Yet it seems like you were interested in it all, even the stuff that wasn’t necessarily musical gold. Paul Major: A lot of it was that there were styles I wasn’t so into, like progressive rock. I’d sort of walk a line, and say, “OK, this is a really good one for someone into this style and sound.” I’d try and weed out the ones I thought were great in any style. But back in the day, when people were discovering local records, the hype thing and rarity was utterly conflated. There was a tendency to really hype things. There were guys who got started a little later than I did and they’d track down everything. AD: One of the terms you use in the book is “real people.” When you’re talking about “real people,” who are you talking about in the context of record makers? And why are you drawn to them? I felt like the barriers between me and him didn’t exist and that gave me this honesty. I could tell it was so heartfelt, the words were so strange and dark. I felt this intimacy. Obviously, I know everybody’s “real people.” The Beatles were real people. But as a child growing up, hearing these records and psychedelic bands, Jimi Hendrix and all that, they seemed bigger than life to a teenage kid. They seemed like the kings in this rarified universe and I’m this little ant walking around that world. But “real people” records — I realized as far as artistic expression, you don’t need a lot of talent if you get your emotional feeling across and communicate. That got clarified for me when I got into Charlie Patton and old Delta blues. There’s no barrier; the guy’s just singing right to you as a human being, directly. AD: I feel like, some times at least, collecting can bring out the worst in people. Not always of course, but it can accentuate some less than savory qualities in people, that need to accumulate and gather. But everyone in the book writes about how you aren’t like that kind of collector at all. Do you have a philosophy about collecting that leads to you being able to avoid falling into those traps? Paul Major: I think it evolved fairly quickly. Early on, I did feel like I was a collector. If I had one record by a band, then I had to have them all, like pasting stamps into your stamp collecting catalog. I started to realize, wait a minute, this band made three records and this one is great and the other two stink. That helped me get away from that. I realized owning the things I wanted made sense, [but] it wasn’t this collection schematic I had to assemble. I know people so obsessed with one record they’d want to buy every [pressing]. They’d have 20 copies of the same album. I developed this reputation because of my enthusiasm, but also because I didn’t have that collector’s mentality, that if I had the best collection that meant I was the coolest dude. [Laughs] There were a lot of people whose identity was residing on these shelves.